This 25-day series will help you see the big picture of the Bible, in just five minutes per day—beginning December 1st. Families want Christmas to be more spiritual and less commercial—more about Jesus and less about Santa. We also want to connect Christmas with the Bible. Sure, we read the “Christmas story” from the book of Luke, but there’s so much more to discover. Within hours of the fall of the first man and woman, the redemption plan was unveiled to all creation: the Seed would bring justice—through the family of Adam and Eve. Have you ever considered that the “Christmas story” began in Chapter 3 of the first book in the Bible? It makes me wonder what happens to the Seed between Eden and the arrival in Bethlehem. 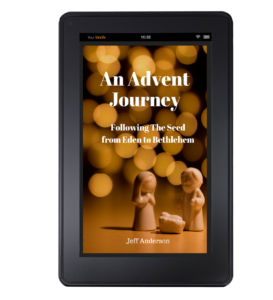 This is what Advent is all about: the ultimate arrival of the Seed in a town called Bethlehem. You and your family can follow this Advent Journey in December, and explore how 64 generations (64 families) prepared for the arrival of Jesus. Also available on Amazon Kindle for just $2.99!